SHADOWS + REDS going to PSNM Signature Show! Once again I've been quiet over here, but just because I've been rocking with work. And so little time, but ever so thankful! 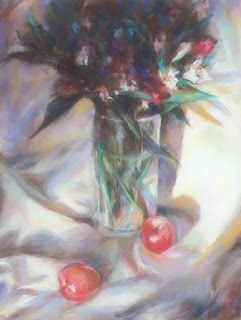 Above floral Shadows + Reds will be on exhibit at the PastelSociety of New Mexico's Signature Members' Show which willrun from October 6th to November 10th at the Los LunasMuseum of Heritage and Art. Always such a honor to be recognized as a Distinguished and Signature Member of this society! Rock on. .. . !